While central Europe is freezing, the weather is breaking records in the Arctic – once again, and towards warmer temperatures, of course. Temperatures in Longyearbyen have been above the long-term average (1960-90) without interruption since November 2010 – that is for more than 7 years! Currently, it is raining in Longyearbyen, and temperatures are above freezing. The situation in highest latitudes, up to the very North Pole, is maybe even more extreme. Even there, in the deepest arctic winter, the time that should be the coldest of the year, temperatures are currently above zero. There is no weather station at the North Pole, but data from remote sensing are clear enough, telling us that the temperature at the North Pole is currently 30 degrees Celsius above the average. In words: thirty degrees Celsius! This applies to almost the whole Arctic Ocean north of 80 degrees. Considering the whole area, temperatures are calculated to be 20 degrees above normals values. The Danish Meteorological Institute has got data spanning the whole period since 1958 and there is nothing that compares. Periods of mild weather in the Arctic are not completely now, but they have been increasing in frequency and intensity since 1980 and especially in recent years. The current episode is, however, recordbreaking. According to Robert Graham from the Norwegian Polar Institute, there have been four periods similar (but less intense) weather between 1980 and 2010, but another four already in the last five yars. 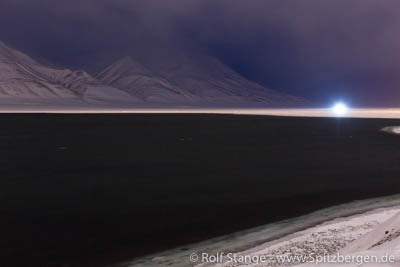 Open water in Adventfjord next to Longyearbyen in the middle of the polar night: nothing unusual today. Today’s event is most likely linked to the weak ice conditions in the Arctic Ocean. In January 2018, less ice was observed than ever before. Even north of Greenland, an area that historically had reliable ice conditions in terms of heavy, dense, multi-year ice, there is currently open water. The temperatures do not contribute to renewed freezing: the automatic weather station at Kap Morris Jesup in northernmost Greenland has up to Sunday recorded a stunning 61 hours of temperatures above zero. The record so far was 16 hours for one whole winter – that’s the whole periods until late April – and it dates back to 1980. While the details of the meteorological processes are not fully understood, scientists do not have any doubt that the high temperatures in the water of the Greenland Sea and those of the atmosphere in the high Arctic are linked. Ice, warm water and the movements of low pressure systems are connected and form a complex system, which also seems to involve the higher atmosphere: unusually warm temperatures were also recorded in the stratosphere, more than 10,000 metres high and thus above the everyday weather events, a couple of weeks ago. Details remain yet to be fully investigated. It should at least get colder again in Longyearbyen from Wednesday onwards.